There is no such thing as a quiet week at Elland Road. Since the start of December, Leeds United owner Massimo Cellino has been disqualified by the Football League and the Championship club have been placed under a transfer embargo. They are the latest instalments of a near-constant stream of off-field dramas that have hung around since the days of reaching the Champions League semi-final under David O'Leary. In the midst of all this uncertainty, head coach Neil Redfearn is trying to guide a diverse team made up of senior players, foreign imports and home-grown talents to a decent finish in the second tier. Redfearn, Leeds's third permanent head coach of the season, joined the academy in December 2008. In a trying time off the pitch, the former Barnsley midfielder is confident of blending the three groups together on the park. "It is vital to get the balance right," he told BBC Sport. "All the players have different perceptions and ideas for how the game should be played, but they all offer something that hopefully will make our club great for years to come. "If you look at the average age of our side at the moment, it is 23 and that is really young. "It is going to get better, and the better it goes, the more confident players will be and the more successful the team will become." 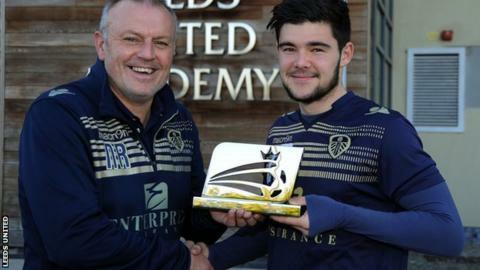 Midfielder Alex Mowatt, 19, is one of the beneficiaries of Redfearn's faith in his former young charges. A regular under Brian McDermott last season, Mowatt found himself frozen out under Dave Hockaday - United's first head coach of the season - but was brought straight back in when Redfearn took caretaker charge at the end of August. Three goals in five November appearances have seen the Doncaster-born teenager receive the Football League's Young Player of the Month award. "I started working with him [Redfearn] when I was in the under-17s," said England Under-20 international Mowatt. "As a midfielder himself, he gave me a lot of tips and advice about how he wanted me to play. "I took that on board and I'm looking to do it in the first team now. It is good to have him as my coach because we know each other so well." "I first worked with him when he was 15. He had great feet and this calmness and awareness about him. He has little runs and spells where he gets goals and creates them, but as he gets more understanding about the game and the level he is at, then he will develop. When that happens, he will start scoring goals and creating them regularly. He has the world at his feet and is an outstanding young player." Redfearn's contract stipulates that he can return to his former role should Cellino decide to replace him. It's a reasonable demand - the charismatic Italian went through 36 head coaches in 22 years as owner of Serie A side Cagliari. And you can understand Redfearn's desire to continue his association with an academy that has produced England internationals Paul Robinson, Alan Smith, Jonathan Woodgate, James Milner and Fabian Delph in recent years. "We are very family-orientated and close-knit," said the 49-year-old. "Respect is shown to parents and they know we'll give kids a chance. "We look past the obvious like 'too small' or 'not quick enough'. If we see something there that we can work with, then we will. There is no player too small, too big or too slow. If they can play, they can play. "We're really big and really strong in our area. You get people like Manchester City and Chelsea throwing money at it but they don't get the Leeds kids because they know they are coming here. "I don't want to rubbish other clubs and how they do it because technology moves on and things get better, but there is a coldness and a lack of soul about a lot of these big clubs. "They don't have the feel for the kids. They get people in who are qualified but they don't have that understanding and knowledge of how to develop them." You can see his point. Four young Chelsea-trained players have featured for the Blues this season, but manager Jose Mourinho was still recently moved to say that the club had to get more from their youth system. City, who have fielded two youth-team graduates in the Premier League this campaign, have just opened a state-of-the-art complex costing around £200m in order to produce more home-grown stars. As for Mowatt, he has been associated with Leeds for more than a decade and can hardly remember a time when his life was not intertwined with the club. He has seen them relegated twice, promoted once and enter (and exit) administration twice. Despite the turbulent times, Mowatt does not appear to have any intention of following Robinson, Smith, Woodgate, Milner and Delph by leaving Elland Road before his prime. "I don't think about playing anywhere else," he said. "I've lived in Doncaster all my life and I've been here my whole life. "You never know what will happen, but if it's going well, then why not stay here?" With a transfer embargo imposed and questions still to be answered over the club's ownership, just how well things go for Leeds could well be down to home-grown talent like Mowatt.